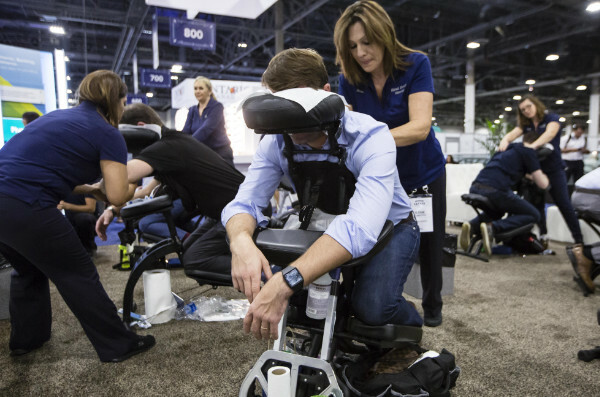 The number of companies offering chair massage Las Vegas as a marketing tool or employee reward is growing every year. It is a guaranteed attention-grabber at Las Vegas conventions, exhibits, and trade shows, and hospitality suites, enabling you to keep your customers on-site longer. Hired Hands Massage can provide you with one or more qualified, attractive, friendly massage therapists, trained to locate and rub out the kinks. All therapists are fully licensed, insured and ready to help make your exhibit a success. Grateful customers will be happy to hear your presentation after receiving this thoughtful gift! Chair massage is a great addition to any employee appreciation event, from holiday parties to health fairs. Hired Hands Massage Las Vegas, 89119 is on the official service provider list of the Las Vegas Visitors and Convention Authority, and is a member of the Las Vegas Hospitality Association. We are booked repeatedly by companies that recognize the ROI of this service. For customized chair massage rate information, please contact us with details about your event including dates, hours, and number of therapists requested. – BILL BERGAIDIS, CEO, E.R. DON CERRITOS INC., COMMERCE, CA. “I had the pleasure of engaging Susan and her team to provide chair massages at our Corporate Event. They were a joy to work with.